The Holy City of Nazareth is the childhood home of Jesus, as described in the New Testament. A center of Christian faith and pilgrimage. John 1: 46: "And Nathanael said unto him, Can there any good thing come out of Nazareth? Philip saith unto him, Come and see". This page is an overview of the old city of Nazareth, the childhood home of Jesus. Nazareth is located in the hills in the center of the Galilee in Northern Israel. The modern city of Nazareth was built over the old village, and few archaeological remains are left from the times of Jesus. Nazareth is today a big city, populated by Christians and Muslims (in lower Nazareth) and Jews (in Upper Nazareth, called Natzeret-Illit). It less than one hour drive east of Haifa. The older section near the Churches is crowded with small shops and narrow alleys. The City grew around this center towards the hills around, with more Arab villages around the city that are practically connected to the City. A general view of the city (from Mount Precipice) is shown in the following photo. In the center (with a black tower): the Church of the Annunciation. 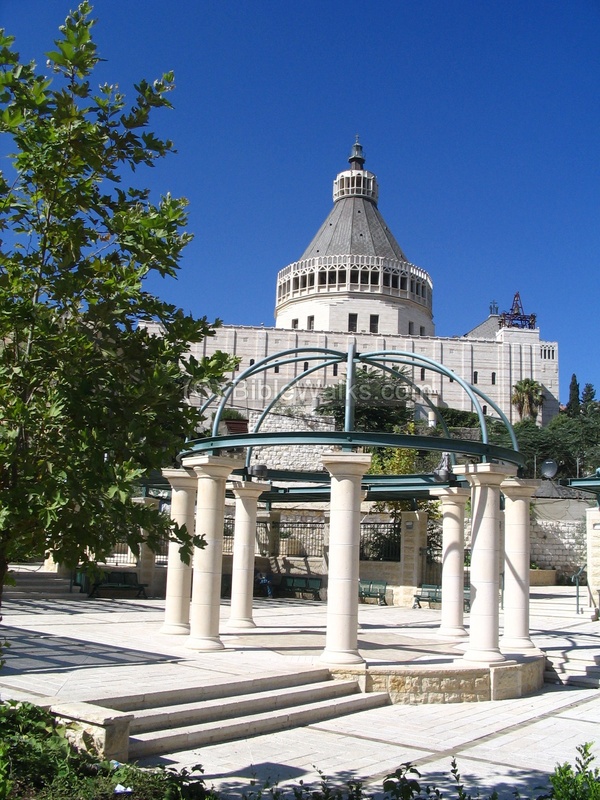 The Basilica of Annunciation is shown in the following photo, taken from the new garden (built in 2006 instead of the controversial mosque which was planned in front of the Church). 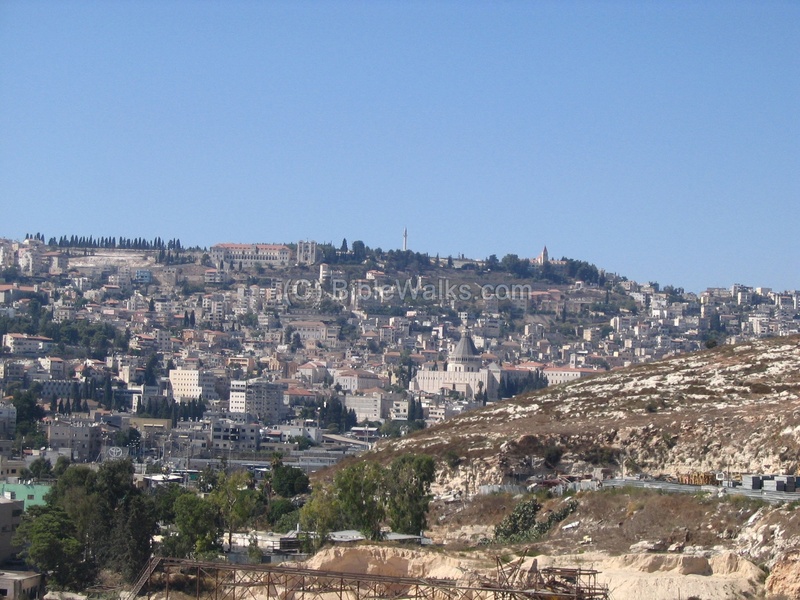 For more photos, enter the detailed sites of Nazareth in BibleWalks.com, which are listed in the bottom of this page. An aerial photo of Nazareth is shown below, indicating the major points of interest in the center of Nazareth. You can press on the purple circles to navigate to additional web pages. 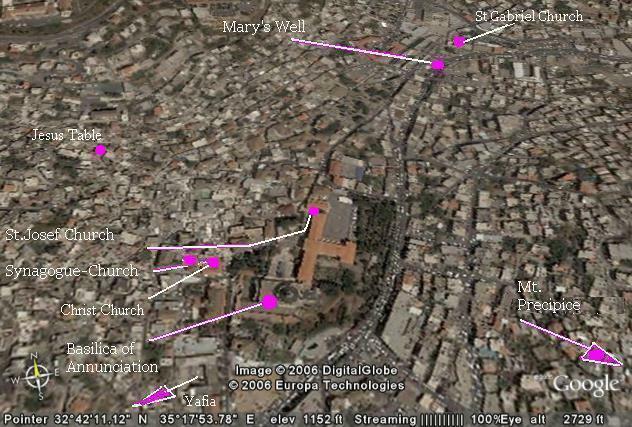 An aerial map is also available for the Nazareth area, where you can also navigate to one of the featured sites in Nazareth. "And Nathanael said unto him, Can there any good thing come out of Nazareth? Philip saith unto him, Come and see". This screensaver presents the sites of the old city of Nazareth, the childhood town of Jesus. Each photo is mapped to a featured site in BibleWalks.com. Download & try it for Free! Click here for details. Nazareth Village A living presentation of the life, times, and teachings of Jesus of Nazareth for all the world.